Some shows are cynical: clever machines designed to squeeze profit from underperforming assets. (Jersey Boys, I mean you.) Other shows are naïve: expressions of belief — in oneself, say, or God — that are only secondarily concerned, if concerned at all, with craft and market. (Kathie Lee Gifford’s Scandalous was one of those.) If you had asked me last week whether a show could be both cynical and naïve, I would have said no. The oiliness of one trait would have seemed incapable of mixing with the wateriness of the other. But that was before I saw Motown: The Musical. In a production whose very title is a brand, cynical almost goes without saying. Even the show curtain features a backlit, gold-leafed Motown M. Yet the cynicism goes much deeper than that. In telling the story of Berry Gordy, founder and longtime chairman of the once-great record company, the book writer (one Berry Gordy, assisted by various script doctors) manages to wedge in 59 songs associated with Motown, including a few new ones. (Most are mere snippets.) What a coincidence that the lead producers of the show include, yes, Berry Gordy and Doug Morris, CEO of Sony Music, which controls the catalog. This would be of only trifling concern — Broadway is a business, after all — if the show were good. But that’s where the naïveté comes in. To a roomful of people who have rarely if ever been part of the creation of a major musical, perhaps it seemed sufficient to tie a few dozen pre-sold numbers together with just enough thread to tell a story. (Mamma Mia! has so far grossed more than $534 million on Broadway doing just that.) But the problem with jukeboxes has never been the songs. The problem is that when songs are forced to tell a tale they weren’t designed for, they lose their deeper effectiveness, and usually end up like leeches, no longer supporting but sucking. In that respect, Motown is the worst jukebox (with the best tunes) I’ve ever encountered. The skeletal book has all the finesse of nightclub patter, with its and-then-I-wrote monotony and jaw-dropping segues (“My dream started long before that … ”) to get from here to there. There are even reporters and announcers saying things like “It all started in a little house in Detroit.” They might as well be traffic signs. Still, the naïveté could have been charming, in the manner of a child’s book report; Gordy paints himself in primary colors as an endlessly hopeful, good-natured believer in talent and love and family. But the combination of backslappy good cheer and ruthless revisionism is nauseating. Even the framing device — the 1983 NBC television special that celebrated the 25th anniversary of the label — is disingenuous: Gordy, his empire near collapse as the recording industry centralizes, decides to boycott the tribute, which of course by the end (limp spoiler alert) he agrees to join. And while in real life the event was infamous for the bitter rivalries and suppressed resentments it exposed, it’s presented here as a lovefest. We do not, for instance, see Diana Ross shoving former Supreme-mate Mary Wilson, who dared to upstage her as they sang “Someday We’ll Be Together.” Now that would be a musical — or maybe, in Dreamgirls, it already is. Things are not much more credible within the frame. As we follow Gordy from success to success, with pesky setbacks like the assassinations of King and Kennedy or the defection of the Jackson Five peppered on top, we come to understand that the idea of the show is to demonstrate the centrality of black music as a force for change in American culture over the last 50 years. This is a perfectly good theme (Hairspray covered the same territory with much more finesse) but has the effect here of creating false equivalences between songs and events they may have reflected but did not cause. Worse, all these events and songs, crammed into three hours, are given approximately equal value. So the obligatory scene of black militants and girls in batik protesting the U.S. involvement in Vietnam — set to the Motown hit “War (What Is It Good For? )” — takes about a minute. Then it’s on to the Detroit riots of 1967, accompanied by Marvin Gaye’s 1971 “What’s Going On?” History itself becomes a medley: just another “and-then-I-wrote” tale, told from God’s, or Gordy’s, perspective. What’s left out — including the role of addiction and mental instability in Motown’s turmoil — is even more telling. When Florence Ballard is suddenly replaced by Cindy Birdsong in the Supremes, Gordy merely explains that “The pressure of fame is vicious. Not everyone can go the distance.” (Ballard was an alcoholic who died at age 32.) When Marvin Gaye, seeking greater artistic freedom, snarls at the paternalistic Gordy that he’s already “got a dad,” the audience knowingly laughs over what’s omitted. (Gaye’s father shot and killed him in 1984.) And what of Gordy’s own failings? Though his first wife and their three children are mentioned, fleetingly, his other five kids and their five other mothers don’t make the cut. Except Ross, of course. (She and Gordy have a daughter.) Probably because she performed so many of Motown’s hits, her affair with Gordy is made to form the spine of the story, though “spine” is hardly the word. In one deeply mortifying scene, Gordy, finally giving himself a flaw, allows that he was once unable to get it up for Ross. Of course, this turns out to be a cue for a song: Ross’s negligee magically transforms into a beautiful gown as she rises from the bed to sing Holland-Dozier-Holland’s “I Hear a Symphony.” Even Berry Gordy’s impotence is a hit. Despite all this, the production almost passes for something presentable. Brandon Victor Dixon, playing Gordy, is especially credible in his younger, wheedling bad-boy phase, and throughout has the voice and stage chops to sell his songs. (He also gets longer songs to sell, including an eleven o’clock number written for the show.) And most of the musical impersonations, by a hardworking cast of 34 playing almost 100 characters, are perfectly good sketches of the originals. 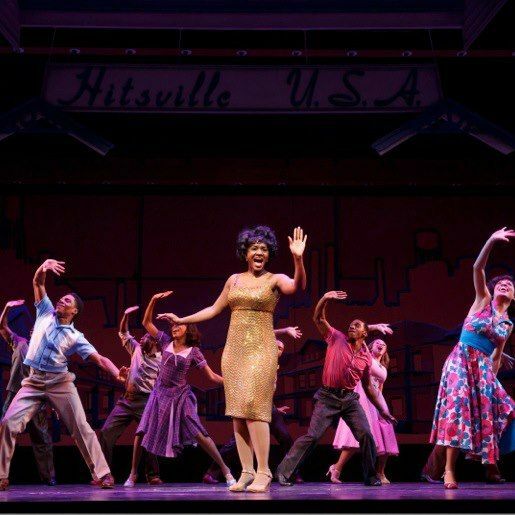 Some are even entertaining in their own right: Saycon Sengbloh as Martha Reeves (of the Vandellas), Eric LaJuan Summers as both Jackie Wilson and Rick James, and Marva Hicks as Gladys Knight pack a lot of what made Motown so thrilling into their few moments. But the restlessness of the story eventually does everyone in, and the direction manages to highlight the script’s deficiencies instead of disguising them. Scenes of “stage excitement” and “stage panic” play out with the quotation marks still in place. Worst of all, the music, despite killer arrangements, just doesn’t feel right repurposed for this context. History, and the residue of history embedded in each artist’s soul, matters. The originals were crafty, not cynical; pure, not naïve. So don’t buy what Motown: The Musical is saying about the songs the label midwifed. As their first No. 1 hit — written by Gordy and Smokey Robinson — instructs, you better shop around. Motown: The Musical is at the Lunt-Fontanne Theater.